Moms get all the credit, and maybe they should – or at least most of it. When it comes to making children, they do most of the work. For the better part of a year, an expecting mother has a soccer game going on inside of her belly. It’s uncomfortable, painful, exhausting – and they don’t even let you drink while you’re going through it. The tradeoff is something called maternal instinct – a biologically driven, internal connection that a mother has with her baby. It’s strong, it’s undeniable, and it can’t be defined or explained. Every human being who has ever lived had a belly button, which was once attached to a cord that literally linked them to their mother – the physical embodiment of the most intimate bond in the world. Like maternal instinct, paternal instinct may be linked to the hormone oxytocin. But fathers aren’t just along for the ride, right? Fathers defend, protect, teach, love, and have weird feelings in the middle of the night that something is wrong – just like mothers. Could it be that the image of the disconnected father comes from social gender roles that have traditionally landed mothers as nurturers and caretakers while fathers parented from a distance? Combine that with the stuff we assume about our mammal colleagues in the animal kingdom (mama grizzlies defend their cubs with their lives; lazy male lions lay in the sun while the lionesses deal with the lion cubs), and you’ve already counted out dad – and his paternal instinct. Linda F. Palmer, DC, author of the book Bonding Matters, argues that the concept of paternal instinct is biologically indisputable. There is such a thing as paternal instinct, and it is driven by the same hormone that drives the mother’s famous and well-documented maternal instinct: oxytocin. This “bonding hormone” first appears in women during pregnancy, grows and accelerates, and eventually drives an incredible amount of a newborn baby’s behavior and development. 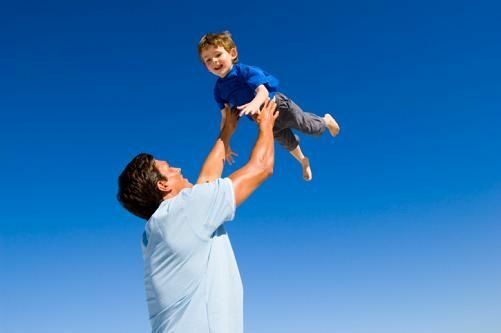 With live-in fathers, Palmer argues, oxytocin becomes present and heightened and drives him to participate in the child’s life and bond with it beyond the physical realm. Pregnancy and breastfeeding are powerful experiences that forge lifelong bonds – bonds that no one but a mother can understand or experience. But evidence suggests that beyond that, there is nothing preventing the father from forming his own, equally intimate bond and paternal instinct over his child – although the evidence is clear that it does require physical contact and exposure. A child’s bond with his/her father can be just as strong as the one he/she shares with mom. As modern relationships change and traditional gender roles shift, fathers are learning that the powerful, almost mythical instinct that bonds mother to child doesn’t sexually discriminate. Paternal instinct is there inside of men – they just have to work hard to build it. Andrew Lisa is a freelance writer living in Los Angeles. He writes about parenting and profiles top businesses such as Federal Auto Loan. Yes there is. A father’s instinct centers around protection of his family, and it covers both children and his wife. “Paternal” might be, therefor, a tad restrictive a word for it.